More sampans! Fill up that asian harbor scene with another variety of the immensely popular little wooden skiffs. 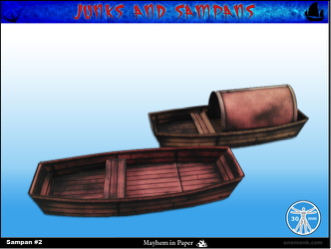 This Sampan paper model measures 3.75 inches in length x 1.5 inches wide and is available in two color shades with a deck shelter option. It is suitable for use with 28-30mm miniatures. It is intended to be printed on 80-110lb cardstock and is not suitable for playing with in the bathtub. However, if you enlarge the design to six-feet in length and build it out cardboard it is possible to row around the lake. A bonus six-inch square water tile is also included. *A sampan is a relatively flat bottomed Chinese wooden boat from 3.5 to 4.5 m (11.5 to 14.8 ft) long. Some sampans include a small shelter on board, and may be used as a permanent habitation on inland waters. Sampans are generally used for transportation in coastal areas or rivers, and are often used as traditional fishing boats. This title was added to our catalog on September 21, 2012.